Diversified portfolios deliver subpar performance when compared to a single, broad market index fund (Vanguard’s Total Market Index Fund (VTI) for example) when the portfolio is held for 10 or more years. 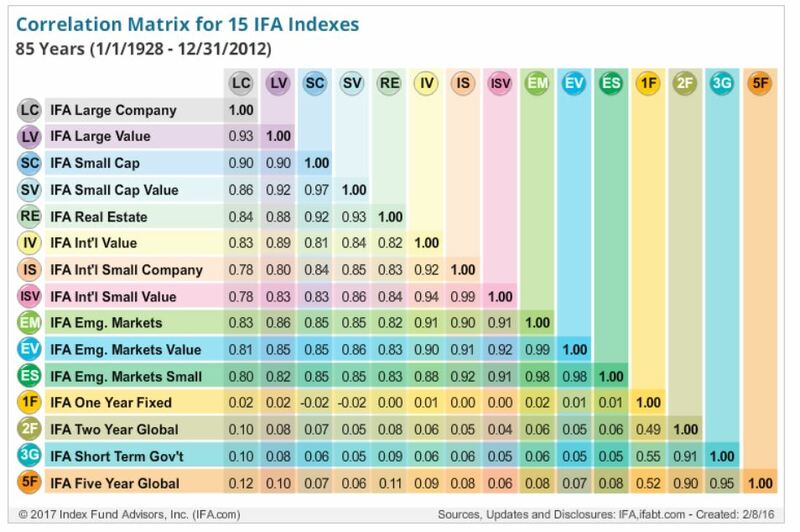 VTI outperforms each of the 15 well known portfolios constructed by financial “experts” over a 46 year period. 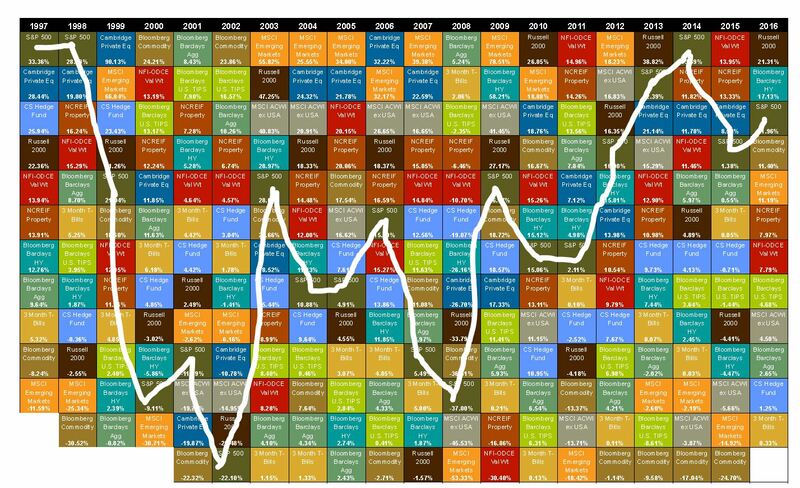 VTI (S&P 500 used as a proxy) outperforms the portfolio arising from all the components of the Callan Periodic Table, with equal weighting to each component over a 20 year period. The equity asset classes of a diversified portfolio are highly correlated. That is, they move in concert; if one is down, they are all down; thereby giving little protection when the market tanks. VTI (S&P 500 used as a proxy) outperforms eight different portfolios developed by investment “advisors” over a 10 year period. VTI outperforms multiple portfolios developed by pension funds, university endowments, retirement funds, etc over various tracking periods. The left hand column identifies 15 portfolios recommended by well known “financial experts”. “CAGR” means Compound Annual Growth Rate. Note that this chart represents data since 1970; that’s 46 years of evidence data. The developer of the PortfolioCharts “wants to share information with other investors to make a difference in making sophisticated asset allocation concepts accessible to normal people“. The values displayed below are taken from his website, Portfolio Charts. Take a look at Portfolio Charts to see how a real analyst deals with the mountain of data that investing generates. His data is comes from the Bogelheads website. 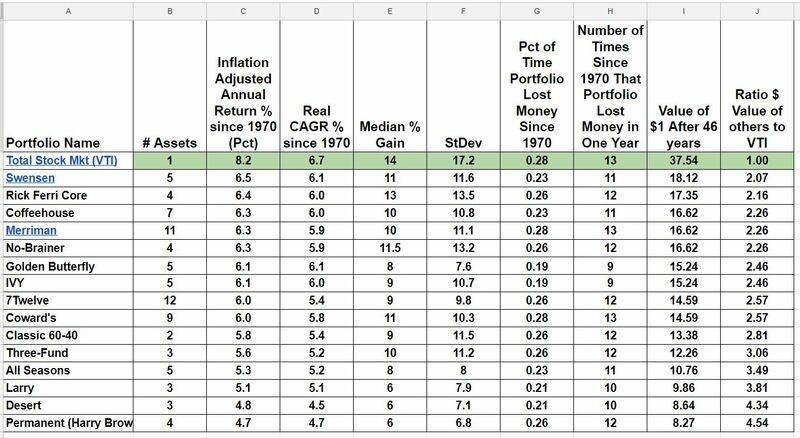 The table above is the most powerful evidence there is that a single fund, VTI, outperforms, by a significant amount, professionally designed portfolios. You won’t be able to do any better by yourself. Callan is one of the largest independently owned investment consulting firms in the U.S. Their Periodic Table of Investment Returns depicts annual returns for 10 asset classes, ranked from best to worst performance for each calendar year. The asset classes are color-coded to enable easy tracking over time. The Callan Periodic Table of Investment Returns conveys the strong case for diversification across asset classes (stocks vs. bonds), investment styles (growth vs. value), capitalizations (large vs. small), and equity markets (U.S. vs. non-U.S.). The Table highlights the uncertainty inherent in all capital markets. Rankings change every year. Well, it does do that! It clearly shows that it is impossible to pick asset class winners based on last year’s performance. The above Callan Periodic Table is reproduced below in spreadsheet form. It clearly shows that diversification via 10 different asset styles and classes does not increase performance. It shows that you would have been significantly better off, with respect to total return, by just being in the simple S&P500. On the other hand, you can see that in the down markets, the loss in the diversified portfolio was less than the loss in VTI. On the other, other hand, the losses were more than recovered in the up markets. On balance, VTI only outperformed a well diversified portfolio 11.28% on average each year versus 9.66% on average each year for the diversified portfolio. The above table from Index Fund Advisors, using funds from Dimensional Fund Advisors, shows how closely their funds are correlated, one to another. If you owned shares in each of the 11 equity asset classes shown in the table, each fund would move in the same direction (some more than others) as the market moved. It is true that the bond and cash components are not correlated but bonds have no place in the portfolio of anyone who is accumulating for investment. They only keep your portfolio from falling TOO far during a decline. They also keep your portfolio from realizing its full potential. They are a drag on performance. Here is “investment advice” from Paul B. Farrell, senior investment columnist for MarketWatch. MarketWatch is a subsidiary of Dow Jones, a property of News Corp. MarketWatch is part of Dow Jones’ Consumer Media Group, along with The Wall Street Journal, Barron’s, the WSJ.com and affiliated internet properties.Presumably Mr. Farrell has some chops! Click on the “Portfolio Developer’s” name to view the portfolio. Below are multiple diversified portfolios, most of which were constructed by people with significant understanding of stock markets and the theory of diversification. None of them outperform the VTI. NOTE All the comparisons below use DIA, an ETF that perfectly tracks the Dow. After I used DIA in the comparisons, I learned that VTI was as good as or better than DIA. I don’t feel the need to go back and change DIA to VTI in the comparisons below since VTI is as good or better than DIA. DIA outperforms 1.18 to 1. For a portfolio that is expected to have a long life (15 or more years) there is no advantage to a diversified portfolio over a single, broad market index fund. In fact, the single index fund outperforms every one of the diversified portfolios examined by this author.